"How would you like to invest in immortality?" is just out in Fortune's on-line tech blog (and likely in the paper edition when it arrives). Briefly, this coming June, 32 year -old Russian tech entrepreneur/billionaire Dmitry Itskov will be announcing his launch of a venture to "allow investors to bankroll research into neuroscience and human consciousness..."
But, Dmitry, sorry to tell you this, but this has already been done! (Albeit fictionally) in my technothriller, A REMEDY FOR DEATH: Playing God with body, soul and bio-tech. Only REMEDY does it better (I modestly propose). I mean, who'd want to come back to find their mind transferred into a robot? A robot, good grief! Wouldn't rich elite folks want to come back into, as one of rich guys in REMEDY puts it, into "healthy, horny 21-year-old bodies complete with all of our accumulated savvy from this first lifetime?" No, seems to me that moving a "brain," a "mind," a "conscious essence" (the jargon I use in REMEDY) into a robot or a robotic avatar is not the way to go . . . not with all that's opening up in the fields of bioartificial organs, organ fabrication, regenerative medicine, growing body parts, and even transgenic and transhuman possibilities. In short, wouldn't those rich elite folks really prefer to come back into a complete new body (as their present one was in its prime), with all their present learning and experience? Another thing: the Fortune article suggests that Itskov's methodology will, "by 2025 . . .place a human brain into a working robot and have that person's consciousness (memories, personality, and everything else that makes up the 'self') transfer along with it." But . . . um . . . how're you going to manage that? Plunking a brain into a robot (or into some kind of tank) is easy enough, but how do you get that -- dare I say the word "person" -- to turn on and come alive? And how does that brain in the machine get to smell the flowers and do all the other little things that make life worth living? How? 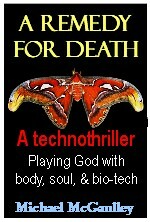 again, modestly, I suggest you check out my technothriller A REMEDY FOR DEATH: Playing God with body, soul and bio-tech. Probably won't get all the questions answered, but I hope it will give food for thought.